"No. 1 Giants Fan" Shows Off "The Hat"
The excitement is building for San Francisco Giants fans, as the 16th home opener in AT&T Park's history will take place Monday afternoon. Some fans drove for hours just to see the Giants take on the Colorado Rockies. Others, are taking the day off. On Sunday evening, AT&T Park was buzzing with fans shopping at the dugout store, buying jerseys and pulling out the World Series shirts. Before Monday's game, The 2014 World Champions pennant will be raised during the pregame ceremony. The first 40,000 fans will receive a replica pennant. Gates will open at 11:00 a.m. for fans who want to be seated early. Game time for Monday's home opener is 1:35 p.m.
On Tuesday. the first 40,000 fans will get a Madison Bumgarner Postseason MVP Bobblehead. Each night this week, something is happening, including Jackie Robinson Day, Irish Heritage Night, and Fireworks Night. The Giants are also facing the Arizona Diamondbacks and the rival Los Angeles Dodgers. With the Giants championship trend of winning in 2010, 2012, 2014 (and not having much success in the odd years), fans are not sure what to expect in 2015. Two women said they are excited to be going to tomorrow's game. 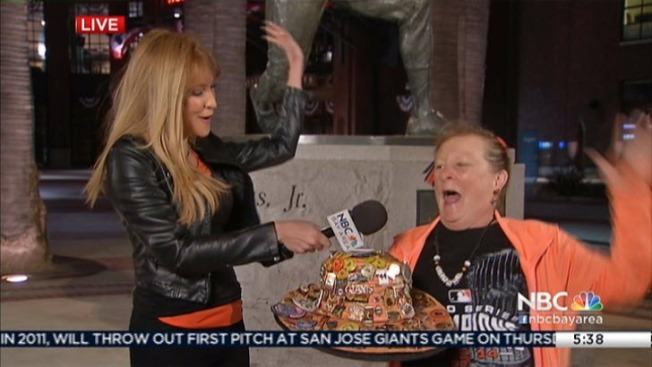 "It's just so much fun," Giants fan Linda Barone said. "The energy inside the stadium is crazy. It's a big party. It's like welcome back after the long offseason. It's just a real fun time." "Very excited to attend, and so grateful...to come along," fellow Giants fan Sherry Bonaccorso said. "And we're into that party mode. We've been up here since Saturday just partying every night, getting ready for the big game tomorrow." One of them just bought a new shirt at the dugout store, where fans were in a shopping mood. Jerseys and orange pants were flying out the door. On Saturday, the 2014 team will be honored for the World Series championship, a pregame ceremony where members of that team will receive their rings.